Belfast Castle, located in the Cave Hill area of north Belfast, was built in the 1860s and is one of the city's most famous landmarks. Located 400 foot above sea level, and offering stunning views over Belfast, the castle is an ideal location for Team Building and Corporate Events. 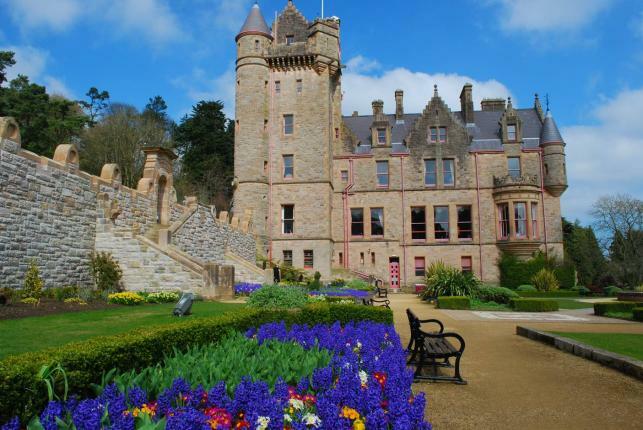 Conveniently located just minutes away from Belfast city centre, Belfast Castle is ideal for your next conference and Indoor Event needs, whether you're arranging an AGM or organising an Evening Entertainment Event. For generations, Cave Hill has been synonymous with Belfast, with its imposing outline visible throughout the city. The landmark, named for the five caves located on the side of the cliffs, contains a wealth of natural, archaeological and historical features, including Belfast Castle. After your Corporate Entertainment afternoon when you've got your breath back, why not step back in time at the Cellar Restaurant, where you can enjoy fresh, local cuisine in our unique Victorian-era surroundings? Or pop into the The Castle Tavern to enjoy the cosy atmosphere. With spacious reception rooms, mouth-watering menus and beautiful grounds, no wonder it's one of Northern Ireland's most popular Team Building venues!